$17 - Petit Lem is proud to release this stylish baby girls romper as a part of their spring 2017 collection. 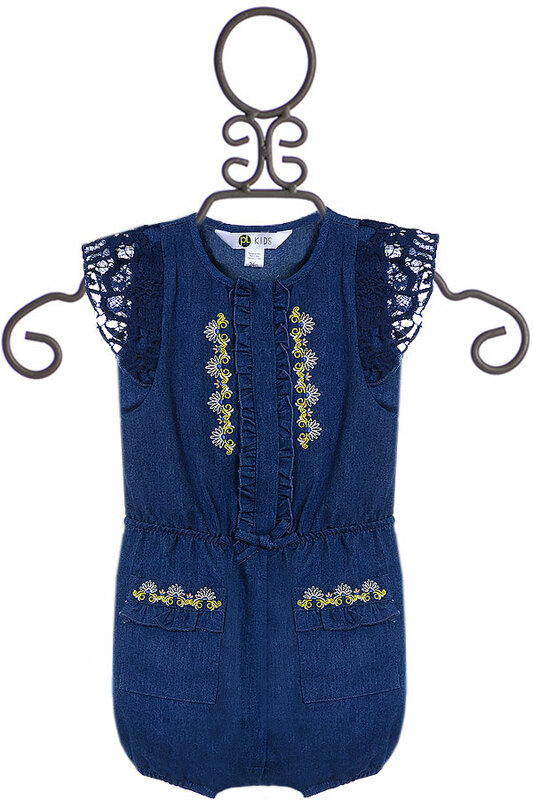 The woven fabric holds a rich shade of denim blue while flutter cap sleeves are sheer in matching crochet lace. The three buttons on the front are framed with ruffles and sweet embroidery, matching the pockets on her shorts. The stretch waist has a bow placed in the center and three changing snaps are found on the inseam. 50% Rayon, 30% Cotton, and 20% Polyester .Exclusive of Decoration. Machine Wash Cold, Line Dry.